Julie Dicker was born in Devon in 1958 and had been talking – and listening – to animals ever since she could remember. Although her principal clients where horse owners, Julie's talent for communication extends to all members of the animal and bird kingdom. Over the many years she had been working as a communicator and healer, she had built up a solid relationship with veterinary surgeons and horse professionals who frequently used her insight on what an animal might be thinking or feeling. She had been the subject of a number of press and magazine articles and appeared on many television programmes. Julie lived on a small West Country farm, with her family and an assortment of animals and poultry. One part of Julie's work was her talent as an animal communicator – or the art of interpreting what an animal is thinking and feeling. The other is to use the gift of healing, either through the laying on of hands or through distant communication, to help restore health to a sick or ailing animal. In the most straightforward terms, it is the ability to translate into words the thoughts and feelings that animals want to us know and understand. Of course animals communicate with us through body language, which we read and often interpret accurately. But 'animal communication' as practiced by Julie and others in this field, is the art of making a direct connection with the horse or other animal's mind and acting as a bridge between animal and human. Although communicating with animals mind-to-mind might be a new concept for some, many people have been doing this for years, perhaps quite unconsciously. Today, there are ever-increasing numbers of individuals around the world adopting a non-physical approach to animal and communication and healing. By connecting with love, integrity and the highest intent to universal energy, it is possible to give and receive information from the animal concerned. There are probably almost as many definitions of 'healer' and 'healing' as there are individuals who practice the art, but a straightforward way of defining it is simply to say that to heal is, 'to restore to health'. One of the earliest forms of healing was traditionally referred to as the 'laying on of hands'. However, the term 'healer' is often used today in all sorts of contexts with healers often defining themselves through a multiplicity of names and disciplines: 'Spiritual,' 'Psychic', 'Magnetic', 'Colour', 'Crystal', 'Therapeutic', 'Reikki', 'Radionic' – to mention just a few. A complex web has been woven around the words 'healer' and 'healing'. Julie's own definition is a simple one: "To me, the essence of all healing is love. Healing is simple and straightforward. If you're genuinely giving love to an animal or a person, than you're giving healing, no matter what you call it. Everybody can do that. And everybody does. Some people do it all the time and never realise it. I think everybody is a healer at some point in their lives, however they define it." Being able to create a space for unconditional love to flow. 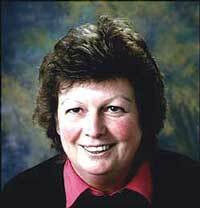 In May, 2000, Julie met Anna Clemence Mews, a writer with a lifelong interest in horses, healing and animal welfare. Many of Julie's clients had been longing to hear more of the remarkable encounters that Julie had experienced in her day-to-day life as a healer and animal communicator. "You should write a book!" they said to her. "I don't have time to write a book," said Julie, "I need a writer!" And so Julie and Anna began the work that was to become What Horses Say. Over a two-year period, Anna carried out dozens of interviews with Julie's clients; saw their horses and wrote up their stories, checking and double checking for accuracy - and read through more than two thousand case notes taken down by owners and riders of the horses Julie had been called to see. To learn more about areas which might cause horses physical pain or emotional distress, Anna listed questions designed to get a deeper understanding of the horse's viewpoint. Do they really enjoy being ridden? And if not, why not? What do they feel about separation? What was their most frightening experience? And what do they need most from us? Julie posed questions like these and many more to a cross section of sixty-two stallions, mares and geldings who form a representative part of her equine clientele. Their answers were often unexpected, astonishing and deeply touching. They can all be found in the ground breaking book, What Horses Say. 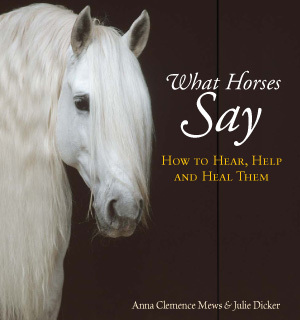 What Horses Say is available now on Amazon - Click here to view.